Happily Ever After!! : Cami's photo shoot! 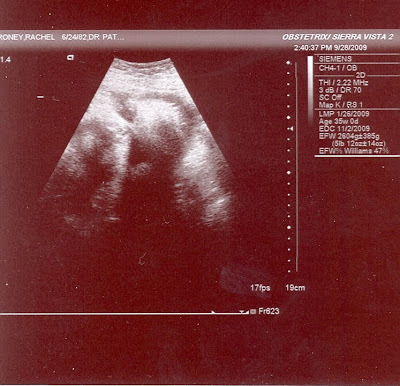 Good luck trying to figure out this ultra-sound picture!! She is like her daddy already, and is camera shy!! But this is a picture of her face, but she has her arm in front of her nose. She did this the last time. The ultra sound tech said that she had fluid in her kidney's and her stomach, which meant everything was working! We could see all four chambers of her heart, and that she was practicing her breating (actually pretty neat!!). Then out of no where the tech said, "Wow, she has a lot of hair!!" She pointed it out, because I had no idea what she was looking at!! She also weighs 5 pounds and 12 ounces. She gave us a date of October 31... Not to far off of what we were thinking, but not like it matters, she's coming October 21! Today we have 22 more days until she will be here. Going yesterday was SO hard!! Mark and I both walked out stunned... Almost a surreal feeling. It was hard seeing her, and knowing that we are SO close!! BUT we're almost there! !